I sleep until 7.45. I was just awake for a minute during the night. It's like being at home. To stay in a city is similar all over the world. Want a quick leave. My thought was to go somewhere to have breakfast and put the bike outside. But no. I want to leave NOW. I eat a handful of my new cookies and empty my spare bottle of water. (Besides 2 x 0.75 l + 0.5 l I have got used to having an extra 1.5 l's of mineral water - for now - soon that won't be enough). My hostess arrive in slippers and look worried at me. 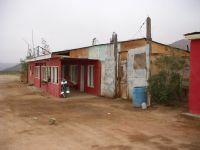 Vallenar, Copiapó, Antofagasta - muy lejos. There' s quite a distance between towns, quite a distance between anything, there's NOTHING here. She reminds me of the lady living below, when I was living in Søborg. Very considerate lady, but she has to make money too. I'm on ruta 5 in two minutes. The shoulder is worse but tolerable. The landscape is flat here in the bay. For once I can see how fast I can go when there are no ups and downs. 23 km/h without much effort. I arrive at a COPEC-gasstation. Quite modern. Above european standard. It's new. for each step I take. There's one thing I've forgotten according to the toilets in Chile (South America?). You don't put the paper in the toilet. The sewers are not built for that. In stead there is a basket beside the toilet. 150 pesos for all this luxurity. I am willing to pay that every time. The road starts inclining. I've just adjusted the altimeter here at the bay to 10 m. Now we'll see how high we'll get. It doesn't look too bad. The inclining percent is comfortable anyway. Soon there is a nice view back towards the town, even it's through the usual mist. But it hasn't been foggy this morning. Now it shows 125 m. I think it'll be time for shorts today. A short break. I have passed the first 30 km and it's 11 o'clock. A while ago the fog came rolling, the sea fog to be precise, up the mountain. Cold and damp. Only for short. And when I look at the map the road turns away from the coast, so that won't bother me hopefully. The map I don't use much. Neither my own nor the others I've had. They never show the things I need to know. A busstop in a deserted area can tell about a almacen (shop) nearby, that sort of thing the map doesn't tell. I've been fooled every time I thought the map was of any use until now. Behind a hill I suddenly looks down a valley, where a bay cuts into the mountain and the road in a giant S declines towards the waves before it disappears up the mountain on the other side. So, that was the slopes that looked like they were far in the country. (I will get wiser). On my way down a sign tells about dolphins on the road at last judged by the looks. No, they're selling fish probably. Anyway there is a minor village of corrugated iron roofs. The road still inclines and has done that for 7 km. For some time I've wondered where it leads, it looks like it just disappears into the mountain. Then I suddenly see something there high, high above me - a car! And now I see how we in a giant hairpin turn first go back and then in a new turn end up there in the heights. Until now the altitude is only 340 m.
After 11 km and 475 altitude meters it's still far to go. We're really crossing to mountain that blocked the road. In the end, after 15 km and modest 575 m I reach to top. The road starts an even decline straight towards new valleys. At a moment a head wind starts blowing. It's nothing compared to Bornholm and the speed I'm going but in the long run the howling in the ears gets to ones nerves. The valley ends somewhere ahead, once more it looks like the valley just stops, so what about the road? use to name a town: "Minas Tolo". I look around: no town. Nothing! It couldn't be more dead. Only the usual bushes and cactus. A sign soon after gives a hint of the direction in which the town should be. A side road to the left. I look in that direction and there, far away at the mountain side some exhumed piles reveal human activity: a mine. There are no sounds, nothing to see, maybe it's shut down, but it still has its sign. And I know I have to take care about that up here. What seems to be towns in the map might show up - like here - to be: NOTHING. A little further comes a village and at the road is a booth, shop, whatever you would call it, where home produced goods are sold. A Pepsi-sign suggest lemonade to be sold and if I have to camp for the night I won't have any stock of lemonade for tomorrow. They have my favourite: Crush in a 1.5 l's bottle. That's 900. Expensive. But they must have got it all the way from La Serena. But don't I want anything else? Empenadas? One? two? I'm tempted. One. And oranges? I don't think I have anymore, there is just one. I get a kilo. What about goat cheese? I'm content with a cup of coffee, but taste the cheese anyway.Fine, but nothing to take along. How much sugar? How much coffee powder? The service is fine. The lady tells that in summer there will be lots of cyclists. Australians, englishmen and frenchmen but apparently not many now. I'm put at a table on a chair which is cleared for the moment, nice with a break. 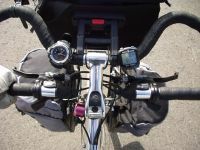 Ruta 5(cinco) - it IS long My "instruments"
I ask how far it is to the next village ahead? That must be Punta Colorada. She consults a man: One hour. I ask if that's on bike? Yes it is cause he himself rides a bike, well not for the moment, now he's trying to get into a car but... and then follows a long explanation where the word "work" is one. I go on encouraged. Short after a sign says 10 km to Punta Colorada, they go slow on bikes here, cause it's totally flat. A few minutes more and I observe something on a distant mountain to the right. Of course, I had completely forgotten. A white dome thrones on the summit: La Silla Observatory. Which I would have visited, but it's closed down in july and august. They have snow quite often. And it's just in front of the snowcapped mountains. But there ought to be more telescopes? And when I look closer I see some minor scrawling. Up with my binoculars. My small 10 x 20 binoculars that my brother gave me, he just had to buy another because it was so cheep. It's exquisite. And through my binoculars I see it quite clear. Like white pearls on a string the telescopes are situated all along the mountain ridge. It's a magnificent sight. The next moment they're gone. And a sign points out that Punta Colorada is not at ruta 5, but 3 km aside. Damn. Do I have to camp? A bit later comes a house or what would one call it? A ranch? behind a big sandy square. It looks like something ina western movie. Pepsi on a sign gives hope. If there's a restaurant there will probably be lodging too. There must be some that end up here in the wilderness. Quite right. Alojamiento? Si, si or like they put it around here: jah, jah. There is supposed to be a lot of german immigrants here. Maybe that's why? 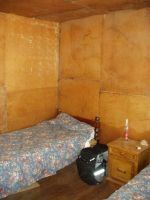 The room is the usual primitive. The walls are masonite plates in varying formats. I soon discover that the bulb at the ceiling is missing. But then there is an empty bottle with a candle and matches. A ha.. that way. The toilet building I find myself. Water flushing toilets, shower, where the curtain is long gone, only the lonely hooks are left. But no water. And now I've just been working on the bike and could use a handwash. Below a water tap outside is a giant plastic container. It's half full of water. Besides the container a minor plastic container. A ha... And soon I've washed my hands. The door lock is just a block of wood with a nail through it. When I show the woman the missing bulb I push it a little, and it falls to the floor. We laugh a lot. That will immidiately be fixed. And a moment later comes mom with a hammer and bang, bang the lock is functioning. According the bulb she says something which I don't catch. Ohh... "un rato". A moment. And something about the generator. Yes indeed. Soon I hear the sound of a gasgenerator and in the next moment she arrives with a bulb in her hand. So it wasn't manana, with which you never know, but actually "un rato". She can't get at the socket so I offers my help, but no. She absolutely has to step on the bed to show her charms. She succeeds in making the t-shirt, which is a bit skimpy, to slip up quite a bit and she still can't get the bulb attached. But at last it works out and - bingo - light. The bed costs 1000 peso, so for once I feel I get a lot out of my money. She's easily provoked to laughter, has poor teeth and her age is hard to judge 25? 30? 35? I can just take the bike with me into the room. Thank you very much. Men who on earth should come in the night here in out of nowhere to steal my bike? Anyway it's touching how considerate everyone is about my bike, it really must look like a million. Indeed I don't. During the day a name has rung in my mind: Chungungo. Unfortunately it was a bit to the side. I would have given a lot to if not slept then just passed through Chungungo. Some names are more tempting than others - to me. Kuala Lumpur fx. And Ouagadougou. Also Timbuktu is a classic which most of us know from Donald Duck. But Timbuktu is just something distant. A threat. A place D.D. goes to hide from the cruel world. But Chungungo!.... I think there was a beach. And this isn't a beach vacation, even I hope to try the Pacific Ocean later, when it get's a bit warmer... if? I eat the usual: chicken and pommes frites with a lot of salt. besides two beers and a cup of coffee. Ask to pay for it all now, because I want to leave early in the morning - I hope. It's 2000!! I ask if the coffee is included? Si. 2000! The bed is 1000. A beer is normally 400. Chicken etc. 1400. A real good price. Or in another way: have I been cheated all the other times? I walk outside to look at the starry sky. Recognize the Southern Cross. The Milky Way really looks like clouds. Venus can still be seen. It's excusite to me, but here it is just normal. The dogs, which I didn't notice when I arrived have been set loose now. They accept me because I come from inside, but had I come from the road!!! The generator hums. I don't notice the masonite plates any more and think it's cosy. I was offered blankets. It'll get cold at night! I know, I have my sleeping bag. Well, that'll properly do. Buena Noche! Sleep tight. I wake up at 23, to sounds as if every piece of furniture is moved about. Somebody arrives to sleeep in the room next to mine. Suddenly I feel the silence - the generator is turned off. Exactly 6 o'clock a crash splits the air, when a truck, which must have sneaked into my room during the night, turns oon the engine. For about half a minute the driver plays the thunder crash symphony with virtous steps on the accelerator, then he lets the engine ease idle down. Nice sound. Like 7 syncronized Harley's. The clouds are heavy over the mountains. I'm not that far from the ocean. The temperature outside is 7.3 degr. Inside it didn't go below 11. It's a rough start. The road inclines steadily, not much, but sufficient. The pace is 11 km/h. In this way I climb up the clouds and the visibility declines till around 100 m. The mist condenses on the helmet and turns into droplets that regularily falls. It's like the droplets from my nose. I practise my skills in avoiding them to hit the frame and the sunglasses, which swings in their wire, at the same time. After 7 km's in this way it gets lighter up there and shortly after I can distinguish the sun somewhere in the clouds. In the following minutes I see from second to second how the sun makes the damp evaporate and I have to stop to see the landscape appear around me. Fantastic! After 11 km signs of humans. Regular piles don't look natural and in the mountain side are dug terrasses, mining! A sign tells of a restaurant. When I've parked I see a big sign telling how far it is from Incahuasi to different towns down south, places I've already visited. The distances makes me happy. I am indeed moving. The condition of the sign tells history: According to the map Incahuasi (a fascinating name too) should be a town, but the mine has dried out, the surroundings have decayed. Besides a few houses that are not likely to house human beings there is just the restaurant which is surprising. Curtains in all windows. Mirrors all over. All different. Red roses on many tables. Artificial, but never mind. A picture in one wall. A private photo? on another. The ceiling is declining in one corner, but that's all there is to ruin the idyll. To my demand: tostada y café, the lady laconic answers: tostada con café. Si, si isn't that the same? I was wrong. After another 2 km the usual green sign tells that here is Incahuasi. I had wondered too why there was nothing left from the town, like I've read about those ghost cities up here north. Incahuasi consists of something you might call a street with one and maybe even two shops. According to a sign you here can fing telephone, first aid and eating. A football field with two diminutive green areas looking like grass can be seen and a newer basketball ground indicates life even the mine most likely IS shut down. Since morning I have followed a railway which also tells history. The track appeared from Punta Colorada and in this name and this track is hidden development. Punta Colorada means the colored spot. This is apparently due to minerals in the ground which a day lead to mining, which founded a town. But from the rusty surface on the trail you notice that it's not in use anymore. The mine has run dry, one day the town will too. The road has now inclined for 25 km. I have long wondered where the road to The Observatories at La Silla was? Now I see some hairpin turns on the mountain in front. Does that lead to La Silla or am I going there? It's going to show soon. I crawl ahead. I and the other trucks. My 10 km/h isn't that bad. Have to ease down. Some trucks do 20 km/h others don't. After every turn a grey line in front shows tha road is still climbing. 12.03 I'm up. After 31.5 km's of climbing. The altimeter shows 1225 m. The snowcapped summits can be seen at the right. It's beatiful and deserted. Where the road was cut into the rocks it made red areas changing with blue/violet interrupted by single green lines (copper?). It's obvious why names like Punta Colorada have evolved. The mountains look like outbreak from small pox in false colors. Red skin and green "poxes" (bushes). I have long wondered where the road to La Silla is. Have I already passed? There hasn't been a sign. Then I see it. Like a long thin line it moves east up here in the pass. And then I see the domes. Difficult to distinguish from the white mountains behind. Now from a new angle. Up with the binoculars. Yes, froom here you can also see the living facilities for the technical staff. Here comes the reward for all the efforts. Km after km jeg roll downwards with 30-40 km/h. Upwards in the cold morning and down now after midday, that's the way. After some time I get cold anyway and stop at a busstop and a village: Cuchiyoyo. What a name. Taste a bit indian. Time for lunch. After a minor infinity of straight road, a bit up a bit down there approches a minor ridge I have to cross - I believe. Unfortunately it shows that the ridge has a passes in both ends. From 775 m I have to crawl again. 1085 m in the end - then it's over - this time. 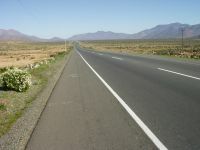 The rest of the way towards Vallenar drags out and out, but then at last I roll down to the town.